I would not have been able to survive my first trimester without a warm epsom salt bath. Apparently there are doctors who tell expectant moms that baths are unsafe, but I find this to be false. I have taken warm baths (not hot) with all three pregnancies without any problem. In fact, I don’t think I could have survived my three pregnancies without it. If you’re in doubt, be sure to discuss with your doctor first. I had severe morning sickness, nausea, headache and body chills that made me feel horrible all day like I was coming down with a bad case of body flu, and a warm bath at night time was the only thing that relieved some of my symptoms before bedtime. Epsom salts are an anti-inflammatory that reduces inflammation and eases muscular aches all over the body. I still use them in my third trimester for my body aches and pains. You can find epsom salt at any local grocery store or pharmacy. You can also mix it with sea salt, scented oil and other aromatherapy products if you’d like. I still remember those early days at week 6 and 7 feeling so horrible and wanting to cry in the bathtub wondering how I will make it through 30 something more weeks. I think I did cry a few times while my family weren’t looking because my body felt so miserable. Yes, it was that hard this third time around but looking back, the pain was worth it. It was just hard getting through it. We mothers, are superheroes I tell you. I discovered this tummy butter during this pregnancy and really love it. It goes on nicely and smells delicious. It relieves my itchy and irritated skin and keeps it moisturized. I use it on my belly as well as my legs after a shower, every morning + night and it’s luxurious, soft and effective in keeping my skin moisturized. Luckily, I still don’t have stretch marks into my third pregnancy. I’m sure it’s genetics as well as self-care but this rub butter is definitely helping. Fingers crossed! Until you get that pregnancy glow, a pair of cute sunglasses is an absolute must-have item. Even after others tell you you have that pregnancy glow, chances are you might not always feel so hot and beautiful, so a pair of cute sunglasses will keep your puffy and tired eyes covered and make you feel instantly chic. There were days when I felt so sick and tired I could barely get myself out of bed. There were days when I barely had energy to function because every bite and every step would make me feel like I have to throw up. This meant messy hair, no-make up, mom clothing (anything that fits and is comfortable) and not exactly feeling my best. A pregnancy pillow is an absolute must-have item especially during the second trimester and on. Around the second trimester, your growing uterus begins to put a strain on your back and hip, making it difficult to sleep on your back at night. It’s also recommended by doctors to begin sleeping on your side (left side is preferred) at this time. I forgot this for a few weeks and woke up with the worst backache and couldn’t figure out what was causing it. This pregnancy pillow came to the rescue. I had used those full-sized ones until this pregnancy which I hated. It’s too big, bulky and just too uncomfortable. This Mini Compact Side Sleeper by Leachco is much easier to sleep with and just as effective as a full body pillow. I ended up purchasing both a full-sized and this mini size one and never used the full-sized one again. Thank God for comfortable sleep during pregnancy, we need as much as we can get. I have a love and hate relationship with all things ginger during and after a pregnancy. It definitely relieves some morning sickness and nausea but not entirely. I tried preggo pops, ginger tea, ginger candy, ginger ale, ginger everything…but one of my favorites was the Chimes ginger chew. It was less than $5 a bag but shipping cost more. After the purchase, I found these at a local Home Goods and TJ MAXX as well so you can see if your local stores carry it. For me these ginger chews helped, but it did not relieve my symptoms completely. 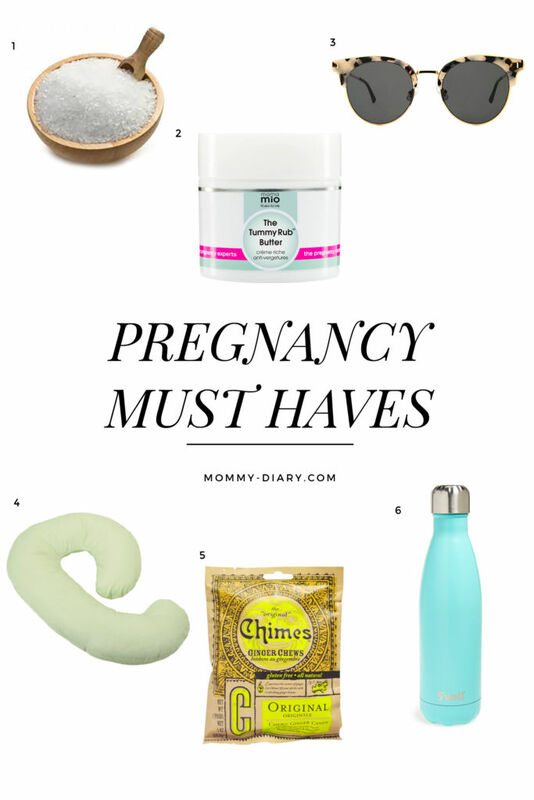 I’ve come to discover that many symptoms during pregnancy is just something mothers are supposed to endure, and all we can do is try our best to take the edge off. These S’well bottles has been a life saver during this pregnancy. I knew I need to drink a lot of water throughout the day, but carrying plastic water bottles didn’t help because I wouldn’t finish it once it gets lukewarm. The water just tastes old, you know? And plus, disposable plastic bottles are not meant to be used over and over again, and the washable ones don’t stay clean around the tip. Once I was introduced to the S’well bottle, I have been drinking a lot more water. I purchased both the 25 and 17 oz ones to use for different occasions. I use the larger 25 oz ones more. Yes it’s bulkier and heavier than standard water bottles but it keeps my water cold for 24 hours, which makes me drink more water throughout the day. I keep it by my bed every night and take it with me everywhere I go. I think this is a must-have item for every pregnant and breastfeeding mama. Yes it’s more expensive but definitely worth the money if it can keep me more hydrated and healthy.